BRUSSELS — Belgian police fired tear gas and water cannons at yellow-vested protesters calling for the resignation of Prime Minister Charles Michel after they tried to breach a riot barricade, as the movement that started in France made its mark Saturday in Belgium and the Netherlands. Protesters in Brussels threw paving stones, road signs, fireworks, flares and other objects at police blocking their entry to an area where Michel’s offices, other government buildings and the parliament are located. 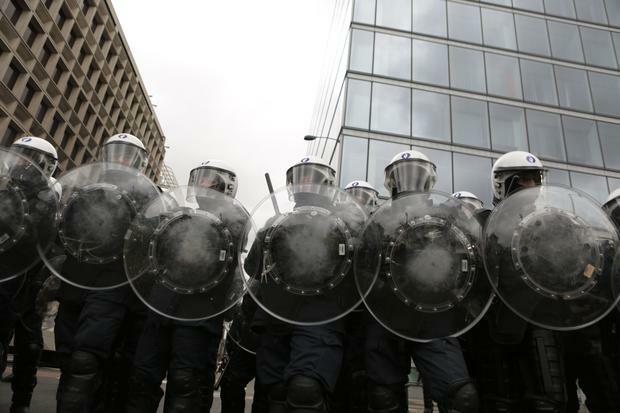 Brussels police spokeswoman Ilse Van de Keere said that around 400 protesters were gathered in the area. Riot police stand in line during copycat “yellow vest” demonstrations rocking neighbouring France, on December 8, 2018 in Brussels. Walking behind a banner reading “social winter is coming,” the protesters chanted “(French President Emmanuel) Macron, Michel resign.” Dozens of people were searched as they arrived, and police warned people to stay away from the area. 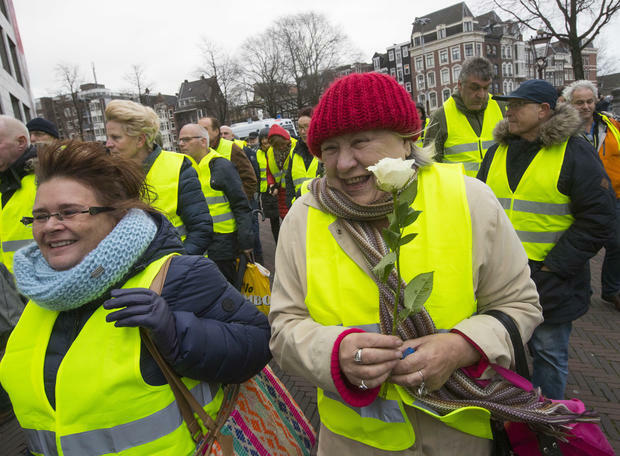 Several hundred demonstrators in yellow vests march during a peaceful demonstration in Amsterdam, Netherlands, Saturday, Dec. 8, 2018. In France on Saturday, crowds of yellow-vested protesters angry at French President Emmanuel Macron and the country’s high taxes tried to converge on the presidential palace, some scuffling with police firing tear gas. By midday, as many as 5,000 demonstrators had gathered in Paris’ center, according to BBC News. More than 500 were detained in the city, said a Paris police spokeswoman, The Associated Press reported. While scattered scuffles broke out Saturday around central Paris, the action seemed less violent overall at midday than at the same time a week ago. Crowds last weekend descended into chaos and destruction, and 400 people were arrested, CBS News’ Charlie D’Agata reported.